Transfer of the flexor hallucis longus tendon may be helpful to restore stability and function to the tendons on the outside of the ankle (peroneal tendons). The peroneus brevis tendon can be injured or become dysfunctional leading to pain or ankle instability. Transfer of the flexor halluces longus may be helpful to restore stability and improve pain. The flexor hallucis longus lies next to the peroneal muscles behind the ankle, making it the preferred choice to restore eversion. The peroneus brevis and peroneus longus tendons pass behind the bone on the outside of the ankle (lateral malleolus) (Figure 1). Together with the posterior tibialis muscle and tendon, coursing behind the inside of the ankle bone, the two peroneal tendons act like reigns on a bridle to control the side-to-side motion of the foot. The posterior tibialis functions to rotate the foot inward (invert the foot). The peroneus brevis tendon inserts at the base of the 5th metatarsal bone and helps turn the foot outward (evert the foot). As the primary resistance to eversion of the foot, the peroneus brevis is responsible for resisting inversion injuries (ex. ankle sprain). Although uncommon the peroneus longus and the peroneus brevis may be damaged beyond repair, or there may be an injury to the nerve controlling the two muscles. In these situations, eversion and stability of the ankle can be restored by transferring the flexor hallucis longus to the peroneus brevis. The FHL tendon is exposed through an incision at the arch of the foot. Under the arch, the FHL lies next to the tendon that flexes toes 2 through 5, the flexor digitorum longus (FDL). Here the FHL can be divided and the portion connecting to the great toe can be easily repaired to the flexor tendon of the lessor toes (flexor digitorum longus) helping to stabilize the great toe. A second incision is made exposing the peroneal tendons. Through this incision the FHL muscle is identified and pulled out through this incision. The FHL tendon can then be repaired to the peroneus brevis tendon. For this procedure to be successful, the FHL tendon needs to heal completely to its newly transferred position. This usually takes a minimum of six weeks, and during this time, immobilization (in a cast or a walking boot) and limited or no weight bearing is required. Following this healing period, physical therapy begins. Therapy focuses on conditioning and coordinating/increasing the strength of the FHL tendon, as well as improving balance and great toe strength. While the FHL transfer may not fully match the strength of the uninjured peroneus brevis, transfer of FHL can still provide the strength to stabilize the foot and ankle and relieve pain. Great toe weakness. This procedure can result in some weakness of great toe flexion. However, this is usually not a clinically significant problem as the flexor hallucis brevis, a muscle in the foot that also flexes the great toe compensates readily. Failure to fully restore function of the peroneal muscles. 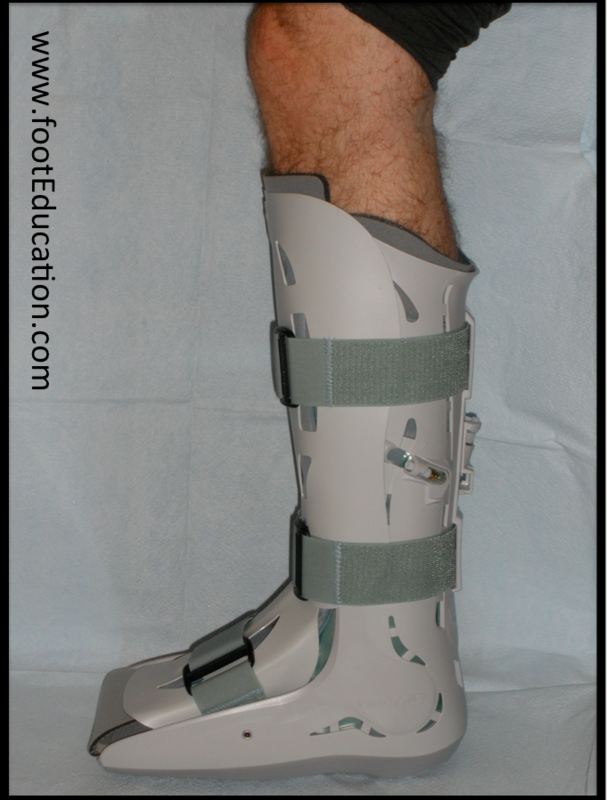 It is unrealistic to expect to regain full strength in eversion equivalent to normal peroneal function, but the procedure can usually stabilize the ankle and foot adequately even without restoring full strength. Nerve injuries. There is a major nerve in the back part of the foot called the tibial nerve which supplies the sensation to the sole of the foot as well as to some muscles in the sole of the foot. In rare instances, this can be injured with resulting pain and/or loss of function of this nerve.